If anyone had any doubt that Christopher Newton is one of the best directors working in Canada, one would have to look no further than "Easy Virtue" and "The Doctor’s Dilemma" now playing at the Shaw Festival. Both are satiric comedies that mask a tragedy but Newton, though taking radically different approaches to each play, has made each a resounding success. Where "Easy Virtue" was lush and naturalistic, "The Doctor’s Dilemma" is stark and expressionistic. That Newton can triumph in both modes is also a testament to the Shaw Festival company--justly regarded as the finest acting troupe in North America. The set for all five acts of Shaw's 1906 play is a functional grey box with two square central pillars designed by Sue LePage. The walls and pillars end about a fourth of the way before they reach the top of the proscenium and continue as black reinforcement rods, some straight, some branching out like trees or veins. Unlike the realistic set for "Easy Virtue" or the elaborate revolving set used for this play in 1991, this is a set we're meant to see as a set. Only Kevin Lamotte's highly inventive lighting and a minimum of furniture moved on suggests the four different locations of the action. In a brilliant touch, the furniture is moved on and off by the actors wearing half-masks of skulls as worn in Latin America for the celebrations of the Day of the Dead. They move in and out in curious synchronized dance movements choreographed by Jane Johanson at the start of the play and in the entr'actes. The association with the Day of the Dead immediately sets the macabre-comic tone of this comedy with death at its centre and establishes the stylized acting Newton will assign to the Shaw's satiric portraits of members of the medical profession. Shaw deliberately introduces us to five caricatures of doctors who come to congratulate Sir Colenso Ridgeon on his recent knighthood, before setting the plot in motion with the arrival of Jennifer Dubedat, the only layperson in the first act other than the maid. We meet the doctors in increasing order of eccentricity. Ridgeon (Blair Williams), the doctor of the title, seems the most "normal" except for allowing himself to be babied by his maid (Jennifer Phipps), not seeing that the "pains" he feels may be due to his bachelorhood and not wishing to see any of the non-doctors in his waiting room. In the first to enter, Leo Schutzmacher (Neil Barclay) we see a doctor obviously proud of the wealth and position his profession has brought. In the second, Sir Patrick Cullen (Bernard Behrens) we see the retired doctor who knows that all the fashionable "new" treatments are really not new at all since he's lived long enough to see things come full circle. He remains seated and facing the audience for most of his time on stage. Next in, the surgeon Cutler Walpole (Lorne Kennedy in his first appearance at the Shaw) strikes various poses as he propounds ad nauseam that all illness is a form of blood poisoning which can be cured only by surgery, specifically the excision of the "nuciform sac" (which none his colleagues believe even exists). Then we have Sir Ralph Bloomfield Bonington (Jim Mezon in a rare comic turn), who is all hyperactivity, fiddling with and usually wrecking whatever comes to hand, restlessly wandering over the set, as he repeatedly claims that injections are the cure-all because they "stimulate the phagocytes". In the last three cases it is quite clear how Newton has related a restricted range of movement to the philosophy of the character. Last to appear, always in a cowed position and looking more like a tramp than a GP, is Dr. Blenkinsop (Guy Bannerman) who is close to poverty because is clientele are themselves close to poverty. Unlike the others, he appears as a caricature not because of his monomania but because of society's attitude of indifference to the poor. 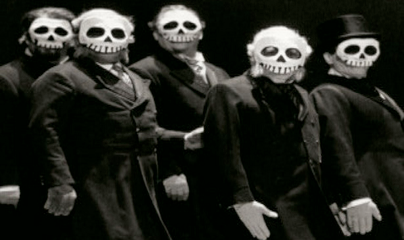 None of the five doctors change in any way during the course of the play so that, as with a proto-expressionist like Wedekind, a personal drama is played out against the backdrop of an unaltering satirical picture of society reinforced by the strictures of LePage's set, Johanson's choreography and Newton's direction. The focus of our interest is the two characters who do change--Ridgeon and Jennifer Dubedat (Severn Thompson), the wife of a brilliant young artist dying of tuberculosis. Dr. Ridgeon's dilemma is twofold: he has space in his experimental clinic for only one more patient, but who should he save--the dying artist or his friend, Dr. Blenkinsop, who also has tuberculosis? Which is more valuable to society? And who is fallible man to play God in making such a choice? Ridgeon is fallible since his second dilemma is whether to act objectively or subjectively since he has fallen in love with Mrs. Dubedat. In 1991 Michael Ball played Ridgeon. By casting Blair Williams, whom physically we can more easily imagine as a suitable match for the artist's wife, Newton cleverly draws the audience in to the trap of rooting for him so that when Ridgeon makes his fateful decision, we are fully implicated as well. Credit must, of course, also go to Williams, who fully succeeds in the difficult task of making Ridgeon's very weakness seem sympathetic. Credit, too, is due to Severn Thompson, who is so expert at engaging us with the idealistic young women she plays, even, as in this case, we wonder whether her idealistic view of her husband is misplaced. Newton also has made the drama more complex by emphasizing the highly dubious nature of the artist, Louis Dubedat. In 1991 Stephen Sutcliffe elicited our sympathy for the dying painter, making us overlook, as does his wife, his many flaws. This time Mike Shara, in his best-ever performance, plays Dubedat as proudly amoral, disobeying his wife at a moment's notice, sponging money from people at every turn and even willing to turn his own death into a publicity stunt. In this way Newton makes Dubedat's monomania in holding art above all else directly parallel the various obsessions of the doctors. Newton's approach thus brings out the full moral complexities of the drama and of our own engagement with it. In so doing he demonstrates more clearly than ever that this is one of Shaw's greatest plays. Photo: The doctors in The Doctor’s Dilemma. ©2000 Shaw Festival.